SMEI was deeply saddened to hear of the untimely passing of Professor Mícheál Ó Súillebháin on November 7th 2018. At the Annual Conference of SMEI in the Royal Irish Academy of Music on November 2nd, Mícheál was granted Honorary Life Membership by the Society. The speech made in his honour by SMEI Assistant Chair, Dr Regina Murphy of DCU is attached. i gCónaí ag Cruthú, ag Casadh is ag Gaiseadh Idir Eatarthu. A chomhghleacaithe, a chairde, is mór an onóir dúinne an bhallraoíocht oinigh saoil seo a bhronnadh ortsa a Mhíchíl Uí Shúilleabháin mar Ollamh, mar cheoltóir, mar chumadóir, agus go mór mhór mar chara do Chumann Ceol Oideachais na hÉireann, agus muid bailithe anseo le haghaidh ár gcomhdháil bhliantúil in Acadamh Ceoil Ríoga na hÉireann, Baile Átha Cliath. Colleagues, friends, it is a great privilege for us to bestow this Honorary Life Membership on you, Mícheál Ó Súilleabháin, as a professor, a musician, a composer, and especially as a friend to the Society for Music Education in Ireland as we are gathered for our annual conference in the Royal Irish Academy of Music, Dublin. Regina Murphy, delivering a heartfelt speech on Mícheál Ó’Suilleabháin’s contribution to the musical life of Ireland. Mícheál is something of a household name in Ireland as the ‘face’ of Irish music – a legacy that has its roots in the early phase of his academic career at University College Cork from 1975 to 1993, and his doctoral studies at Queen’s University Belfast as a student of the ethnomusicologists John Blacking and John Baily. Here he worked as something of a successor to Seán Ó Riada and alongside the late Professor Aloys Fleischmann who, among other things, undertook to catalogue traditional Irish tunes from 1600 – 1855, a task that lasted over 40 years and was ultimately completed after his death by Mícheál. Indeed Mícheál’s creative integration of traditional Irish music and classical music blossomed during this period at UCC and he recorded several albums under the Gael Linn and Virgin/Venture labels. Mícheál’s musical imagination pushed the boundaries of Irish music from its hallmarks of melody, tempo and form for solo instruments, typically in unison, adhering closely to the received tradition, towards more unexpected textures, pulses and harmonies with other traditions, musicians, modes and places, blending classical approaches with traditional in innovative ways. Although his compositional work includes vocal settings and SATB compositions, it is his music for string orchestra and the merging of harpsichord styles with traditional piano that made for a unique and distinctive sound(1). His musical collaborations are testimony to his creativity and were crucial to the shaping of Irish identity towards the millennium – with the 1995 television series A River of Sound(2) being indicative of this. This series also heralded the First Conference on Irish Traditional Music Crosbhealach an Cheoil 1996 in Dublin, where Mícheál featured as a keynote speaker. 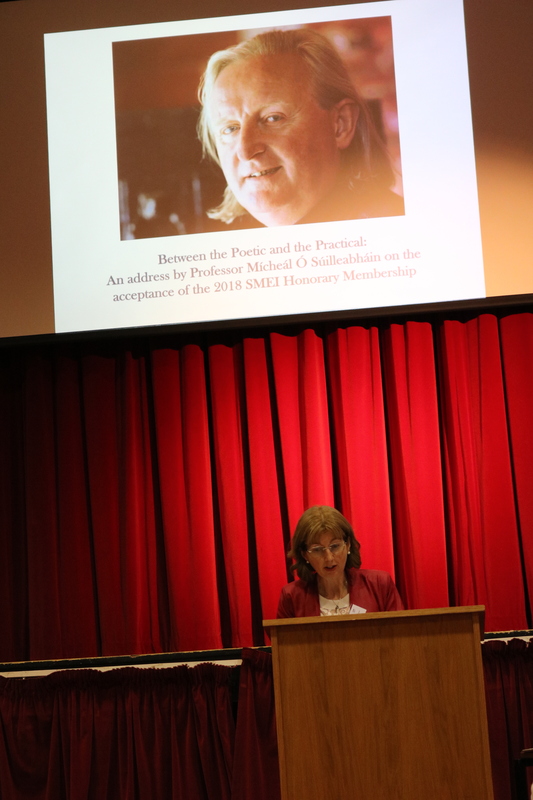 SMEI Chair Lorraine O’Connell reads out a message from Mícheál Ó’Suimmeabháin to the Gathered SMEI membership. On the screen above is the original logo of the Irish World Academy, designed by Mícheál himself, and which is full of symbolism and aspiration. But even now, for those of us in music education seeking to develop new pathways in our curricula at first, second or third level, Mícheál’s consolidation of research, cultural context, local expertise and innovation is surely among the supreme examples of the pursuit of a vision and its realisation at the highest level. Given his energy and vision, it is hardly surprising that Mícheál left Cork to take up the chair of Music at the University of Limerick in 1994 and this is where he really thrived. It was here that definitions of music and music education in the academy expanded through various forms, modalities, contexts, musicians and a select team of dedicated colleagues. Is the general music education system the appropriate and natural ambience in which to promote traditional music? In an educational system hitherto dominated by the norms of method and repertoire derived mainly from western art music, how could already overloaded curricula be flexed to accommodate an enhanced presence of traditional music? What is the so-called first culture musical experience of Irish children? He argued that the meaning and significance, in educational terms, and especially in prethird-level contexts, of such classifications as traditional/folk, ethnic, ‘musics of the world’s cultures’, multicultural, multi-ethnic, non-tonal, exotic etc. must be clearly understood in curriculum development and syllabus construction(3). He was humble, but confident, his message simple but ingenious. His words were imbued with contemporary poetry, ancient philosophy and sharp insights. 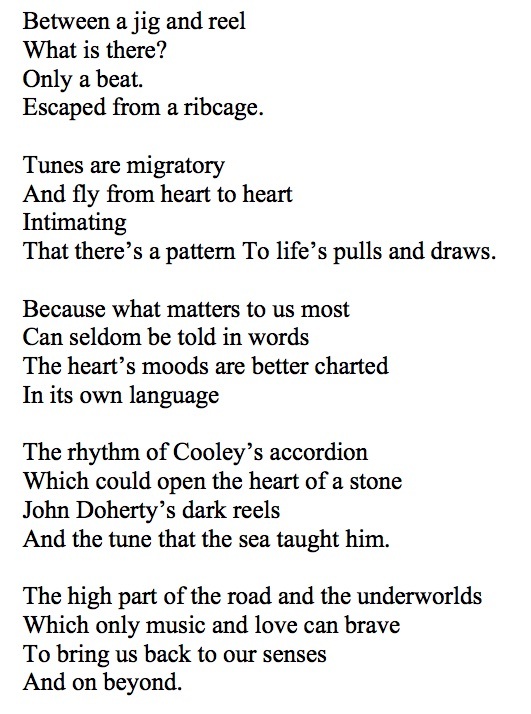 In the days before TED talks, this one had all the magic ingredients without an ounce of cynicism: He shared his dream for music: Imagine a new university faculty; design a new purpose-built facility; begin with postgraduate students; attract the best teachers, scholars and musicians internationally; call it the Irish World Academy of Music and Dance. The audience was rapt. It was a talking point for the rest of the week, months, years later. Professor Magne Espeland, Chair of the Bergen conference, recalls that “Mícheál inspired the global education community profoundly through his visionary speech and that he is a true global pioneer for music education traditions”5. On a personal level, I will forever be grateful to Mícheál for the sense of pride in being Irish that he generated on that day. While the ensuing successes of the IWA in the University of Limerick are legion, and well documented in various sources, such as the University’s website itself, Fintan Valley’s (2011) Companion to Irish Traditional Music, and the Contemporary Music Centre of Ireland6, to name but a few, there have been numerous occasions since when those of us on this island have grown in the confidence borne from the reimagining of our identity and the valuing of our musics, in all forms, such that it has enabled us to grow as musicians, as teachers and as citizens in a young republic. Mícheál’s influence on the education system and cultural institutions alike has been gigantic but subtle, never demanding but ever present. And in this, he has never ceased. In SMEI (Society for Music Education in Ireland), he was a crucial support to our earliest endeavours to seek recognition with ISME as a fledgling organisation back in 2010, when we were seeking to achieve national affiliate status with the international organisation. 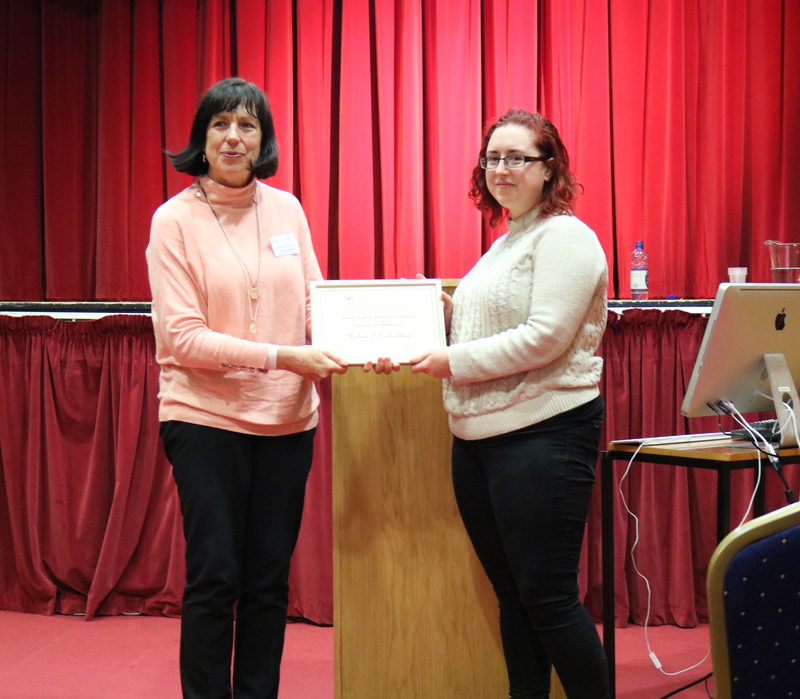 Again, three years later, Mícheál brought the same generosity of spirit, with spirited provocation to our SMEI 2013 conference – The Gathering –which was one of our most ambitious projects as a national committee. Yet, for each of us in SMEI, Mícheál has extended a generous spirit as a professional colleague in innumerable ways. It is this ability to see what might be, what we might become, individually and collectively, that is Mícheál’s gift to us – a love of music and all our ways of envisioning and embodying it. 1 Francis Ward, BA, MA, PhD (IWA). (1st November 2018), personal communication. 2 This was a joint RTÉ and BBC Northern Ireland production written and devised by Mícheál Ó Súilleabháin with collaborators Philip King and Nuala O’Connor from Hummingbird Productions. 3 Heneghan, F. (1999-2001) Music Education National Debate. Dublin: DIT. 4 ‘Samspel’: ISME Bienniel World Conference Proceedings, Bergen, Norway. August 2002. 5 Professor Magne Espeland, Norway. (2nd November 2018). Personal communication.